Behnamian, J., Fatemi Ghomi, S., Jolai, F., Telgerdi, M. (2018). Optimal design of cross docking supply chain networks with time-varying uncertain demands. 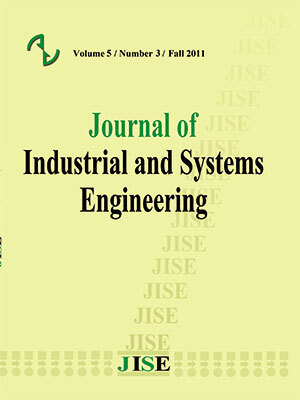 Journal of Industrial and Systems Engineering, 11(2), 1-20. Javad Behnamian; Seyed Mohammad Taghi Fatemi Ghomi; Fariborz Jolai; M. Telgerdi. "Optimal design of cross docking supply chain networks with time-varying uncertain demands". Journal of Industrial and Systems Engineering, 11, 2, 2018, 1-20. Behnamian, J., Fatemi Ghomi, S., Jolai, F., Telgerdi, M. (2018). 'Optimal design of cross docking supply chain networks with time-varying uncertain demands', Journal of Industrial and Systems Engineering, 11(2), pp. 1-20. Behnamian, J., Fatemi Ghomi, S., Jolai, F., Telgerdi, M. Optimal design of cross docking supply chain networks with time-varying uncertain demands. Journal of Industrial and Systems Engineering, 2018; 11(2): 1-20. This paper proposes an integrated network design model for a post-distribution cross-docking strategy, comprising multi product production facilities with shared production resources, capacitated cross docks with setup cost and customer zones with time windows constraints. The model is dynamic in terms of time-varying uncertain demands, whereas uncertainty is expressed with scenario approach and contains both ‘‘wait-and-see’’ and ‘‘here-and-now’’ decisions. Inventory is just permitted in plants and over several time periods. The objective of the model is to minimize the sum of the fixed location costs for establishing cross docking centers and inventory related costs across the supply chain while ensuring that the limited service rate of cross docking centers and production facilities, and also the lead time requirements of customers are not violated. The problem is formulated as a mixed-integer linear programming problem and solved to global optimality using CPLEX. Due to the difficulty of obtaining the optimum solution in medium and large-scale problems, two heuristics that generate globally feasible, near optimal solution, Imperialistic competitive algorithm (ICA) and simulated annealing (SA), are also proposed as heuristics. We find that CPLEX is not able to solve some of the sets to optimality and turned out to run out of memory, but it performs quite well for small test sets, as compared with the two heuristics. While SA is a faster heuristic method in terms of runtime, ICA generates better results on average, but in more time. Ahmadizar, F., Zeynivand, M., & Arkat, J. (2015). Two-level vehicle routing with cross-docking in a three-echelon supply chain: A genetic algorithm approach. Applied Mathematical Modelling, 39(22), 7065-7081. Atashpaz-Gargari, E., Hashemzadeh, F., & Lucas, C. (2008, June). Designing MIMO PIID controller using colonial competitive algorithm: applied to distillation column process. In Evolutionary Computation, 2008. CEC 2008. (IEEE World Congress on Computational Intelligence). IEEE Congress on(pp. 1929-1934). IEEE. Atashpaz-Gargari, E., & Lucas, C. (2007, September). Imperialist competitive algorithm: an algorithm for optimization inspired by imperialistic competition. In Evolutionary computation, 2007. CEC 2007. IEEE Congress on (pp. 4661-4667). IEEE. Bachlaus, M., Pandey, M. K., Mahajan, C., Shankar, R., & Tiwari, M. K. (2008). Designing an integrated multi-echelon agile supply chain network: a hybrid taguchi-particle swarm optimization approach. Journal of Intelligent Manufacturing, 19(6), 747. Buijs, P., Vis, I. F., & Carlo, H. J. (2014). Synchronization in cross-docking networks: A research classification and framework. European Journal of Operational Research, 239(3), 593-608. Chen, P., Guo, Y., Lim, A., & Rodrigues, B. (2006). Multiple crossdocks with inventory and time windows. Computers & operations research, 33(1), 43-63. Cho, N. (2009). Integrated network design models for crossdocking and warehousing strategies with tactical considerations (Doctoral dissertation, Purdue University). Cota, P. M., Gimenez, B. M., Araújo, D. P., Nogueira, T. H., de Souza, M. C., & Ravetti, M. G. (2016). Time-indexed formulation and polynomial time heuristic for a multi-dock truck scheduling problem in a cross-docking centre. Computers & Industrial Engineering, 95, 135-143. Davis, T. (1993). Effective supply chain management. Sloan management review, 34(4), 35. Donaldson, H., Johnson, E., Ratliff, H., & Zhang, M. (1999). Schedule-driven cross-docking networks: Technical report. Georgia Institute of Technology. Enderer, F., Contardo, C., & Contreras, I. (2017). Integrating dock-door assignment and vehicle routing with cross-docking. Computers & Operations Research, 88, 30-43. Garey, M. R. (1979). DS Johnson Computers and intractability. A Guide to the Theory of NP-Completeness. Gümüş, M., & Bookbinder, J. H. (2004). Cross‐docking and its implications in location‐distribution systems. Journal of Business Logistics, 25(2), 199-228. Jayaraman, V., & Ross, A. (2003). A simulated annealing methodology to distribution network design and management. European Journal of Operational Research, 144(3), 629-645. Ladier, A. L., & Alpan, G. (2016). Robust cross-dock scheduling with time windows. Computers & Industrial Engineering, 99, 16-28. Lim, A., Miao, Z., Rodrigues, B., & Xu, Z. (2005). Transshipment through crossdocks with inventory and time windows. Naval Research Logistics (NRL), 52(8), 724-733. Longinidis, P., & Georgiadis, M. C. (2011). Integration of financial statement analysis in the optimal design of supply chain networks under demand uncertainty. International journal of production economics, 129(2), 262-276. Ma, H., Miao, Z., Lim, A., & Rodrigues, B. (2011). Crossdocking distribution networks with setup cost and time window constraint. Omega, 39(1), 64-72. Melo, M. T., Nickel, S., & Da Gama, F. S. (2006). Dynamic multi-commodity capacitated facility location: a mathematical modeling framework for strategic supply chain planning. Computers & Operations Research, 33(1), 181-208. Miao, Z., Fu, K., Fei, Q., & Wang, F. (2008, June). Meta-heuristic algorithm for the transshipment problem with fixed transportation schedules. In International Conference on Industrial, Engineering and Other Applications of Applied Intelligent Systems (pp. 601-610). Springer, Berlin, Heidelberg. Mousavi, S. M., Tavakkoli-Moghaddam, R., & Siadat, A. (2013). Optimal design of the cross-docking in distribution networks: Heuristic solution approach. International Journal of Engineering-Transactions A: Basics, 27(4), 533. Musa, R., Arnaout, J. P., & Jung, H. (2010). Ant colony optimization algorithm to solve for the transportation problem of cross-docking network. Computers & Industrial Engineering, 59(1), 85-92. Nikolopoulou, A. I., Repoussis, P. P., Tarantilis, C. D., & Zachariadis, E. E. (2017). Moving products between location pairs: Cross-docking versus direct-shipping. European Journal of Operational Research, 256(3), 803-819. Reeves, C. R. (1995). Modern heuristic techniques for combinatorial problems. Advanced topics in computer science. Modern Heuristic Techniques for Combinatorial Problems: Advanced Topics in Computer Science. Seyedhoseini, S. M., Rashid, R., & Teimoury, E. (2015). Developing a cross-docking network design model under uncertain environment. Journal of Industrial Engineering International, 11(2), 225-236. Shapiro, J. F. (1999). On the connections among activity-based costing, mathematical programming models for analyzing strategic decisions, and the resource-based view of the firm. European Journal of Operational Research, 118(2), 295-314. Shi, W., Liu, Z., Shang, J., & Cui, Y. (2013). Multi-criteria robust design of a JIT-based cross-docking distribution center for an auto parts supply chain. European Journal of Operational Research, 229(3), 695-706. Shokrollahpour, E., Zandieh, M., & Dorri, B. (2011). A novel imperialist competitive algorithm for bi-criteria scheduling of the assembly flowshop problem. International Journal of Production Research, 49(11), 3087-3103. Sung, C. S., & Song, S. H. (2003). Integrated service network design for a cross-docking supply chain network. Journal of the Operational Research Society, 54(12), 1283-1295. Tang, S. (2007). The impacts of cross-docking operation on supply chain management (Doctoral dissertation, The Hong Kong Polytechnic University). Tsiakis, P., Shah, N., & Pantelides, C. C. (2001). Design of multi-echelon supply chain networks under demand uncertainty. Industrial & Engineering Chemistry Research, 40(16), 3585-3604. Van Belle, J., Valckenaers, P., & Cattrysse, D. (2012). Cross-docking: State of the art. Omega, 40(6), 827-846. Yan, H., & Tang, S. L. (2009). Pre-distribution and post-distribution cross-docking operations. Transportation Research Part E: Logistics and Transportation Review, 45(6), 843-859. Yu, V. F., Jewpanya, P., & Kachitvichyanukul, V. (2016). Particle swarm optimization for the multi-period cross-docking distribution problem with time windows. International Journal of Production Research, 54(2), 509-525.